Part of bringing the Accounts Receivable package up to its full capa­bility when you first receive it is the process of loading the A/R Open Item File with the initial contents of your customers' accounts. When that is done, you run this application to set each customer's account balance field in this customer record to the total of his open items. 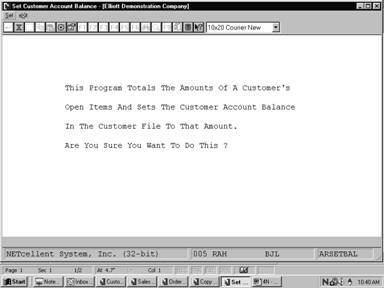 From that time on, the programs, which add transactions to the customer’s account, will update this account, balance in the customer record so that it will always be accurate. Thus, the Set Customer Account Balances program will probably only have to be run once. But if you are ever unsure whether the account balance stored in a customer's record is actually correct, you can run this program again. It will not do any harm if you run it more than once.